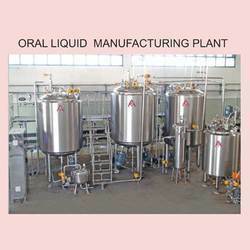 Manufacturer of a wide range of products which include sugar syrup mixing vessel, oral liquid manufacturing plant, zero hold filter press, sugar syrup manufacturing vessels, liquid manufacturing plant and syrup manufacturing plant. Ideal solution to the pharmaceutical industry for the production of oral liquids. The process consists of Sugar syrup preparation. Ingredient Mixing and Storage with product distribution piping. Range of plant covers from 50 L to 15000 L with various options in top and bottom entry agitators for mixing and homogenizing of syrup & suspensions. Product contact parts are SS 316 / SS 316L with option of jacketed vessels and heating system suitable for steam as well as electrical. 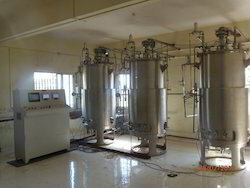 This system consists of a closed circuit manufacturing facility from feeding of Sugar / Water Phase to loading the Volumetric Liquid Filling Machine. The Sugar and Water, are load with vacuum system or by mechanical system or manually. The Sugar Syrup Vessel is supplied with high speed stirrer & electrical heating ( In small model ) / steam heating facility (In bigger size model ) . The sugar syrup is prepared at required temperature & are transferred to Manufacturing Vessel by vacuum or by transfer pump. 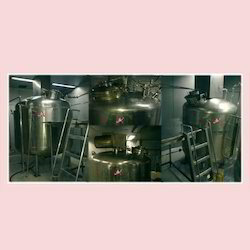 The Storage Vessel is then taken to the filling area (if it is small capacity) and is connected to again Liquid Transfer Pump. 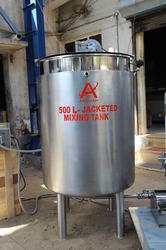 Or Storage Vessel remains fixed (In bigger size) & pump transfer the Liquids in the float tank which is connected with filling machine. We are one of the leading organizations that is engaged in manufacturing, supplying, trading and exporting Oral Liquid Manufacturing Plant. Manufactured using quality components and spare parts, these plants are designed in accordance with international quality standards and norms. Also, these products can be customized as per the specifications laid down by our esteemed patrons. 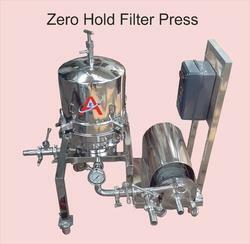 AKSHAR ENGINEERING WORKS range of Filter Press is used for wide range of applications by several industries like Pharma, bulk drugs, distilleries, beverages & other industries. The Cartridge assembly consists of plates, perforated screens, spacers and fitter media. Interlocking spacers internally form single pipeline. The unfiltered liquid is centrally fed under pressure from bottom inlet. The liquids spreads out equally on each plate fitted with filter media. Solids remain on filter media and clear. filtrate flows through precisely made holes on sides of plates and collects in the shell, which then comes out through the outlet. In this process, solids are evenly distributed on each plate. The cake is then cleaned from the filter material and used again for filtration process. The Sugar Syrup Vessel is supplied with high speed stirrer & electrical heating (In small model) / steam heating facility (In bigger size model ) . 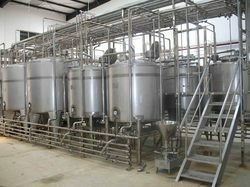 Our organization is counted amongst the most distinguished manufacturers, suppliers, traders and exporters of Liquid Manufacturing Plant. To fulfill the demands and needs of customers, all our products are provided in various models and designs at most competitive prices. In addition to this, all our products can be customized as per the demands and specifications provided by customers. 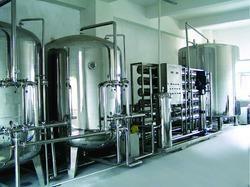 Our clients can avail from us an eminent range of Syrup Manufacturing Plant. Widely demanded by customers throughout the nation, these products are available in different models and sizes at reasonable prices. Also, our expert quality controllers thoroughly check all the products on various parameters to ensure flawlessness. We are highly appreciated in the international market for our qualitative range of Injection Liquid Manufacturing Plant. Designed to perfection, all the offered products are manufactured using quality components and material. Confirm to international quality standards and norms, these plants are provided to customers in various configurations at market leading prices. All pipes, pipe fittings and valves are of SS304 / SS316 ( as per customer requirement) seamless quality, internally electro polished, with tri-clover ended joints. 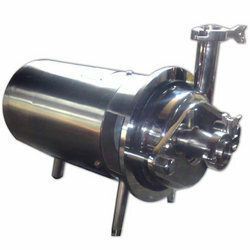 Our range of Stainless Steel Transfer Pump with trolley is widely used for transfer of liquids and viscose products. The pump is positive single screw type with SS rotor. Centrifugal pump and is renowned for high-end features such as corrosion resistance, abrasion resistance and improved efficiency. We offer these pumps at market leading prices. 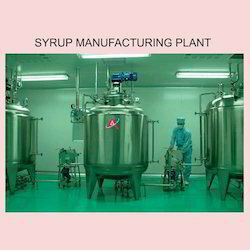 Looking for “Liquid Syrup Plant”?